Brent and WTI are the two most largely traded qualities of Oil. We will see that they are different not only in the quality and price, but also in the main drivers of their performance. Brent is a relatively light and sweet quality, originally extracted in the Northern Sea and later become the World Benchmark for Oil Prices. As no restrictions are enforced on physical and financial trading of Brent, supply and demand coincide with global supply and demand. Supply, which in 2014 is predicted around 91.5 million barrels per day (bbl/d), depends mainly on OPEC countries (35.7 bbl/d), Russia (10.7 bbl/d) and US (9.8 bbl/d) production. It is projected to increase at a global level by at least 1.4 bbl/d, mainly driven by an increase in US and Canada production. However, there are two countries worth to analyse more in dept: Libya and Iran. 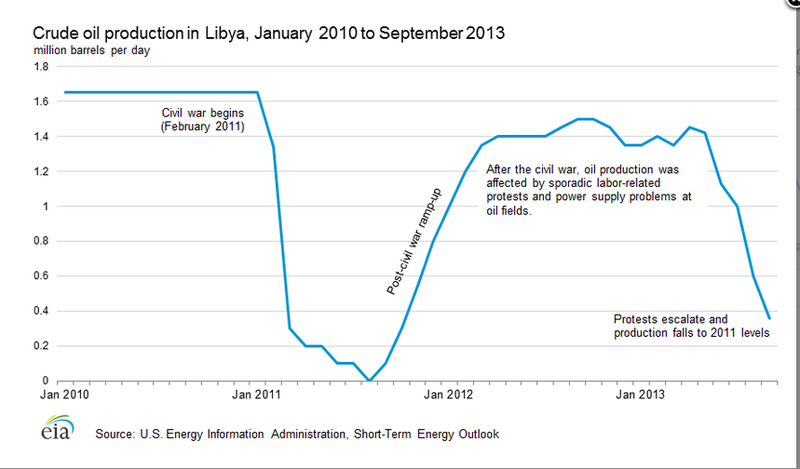 Due to an internal rebellion, Libya, which has a potential Oil production of 1.8 bbl/d, is now producing less than 0.3 bbl/d. Were the situation solved, the production could catch up quickly up to 1.5 bbl/d, just as it did after the Revolution. Thanks to the extradition of the son of Muammar Gaddafi from Niger during the last week, we believe that tensions and protests in this country are going to diminish, allowing production to reach its full capacity. 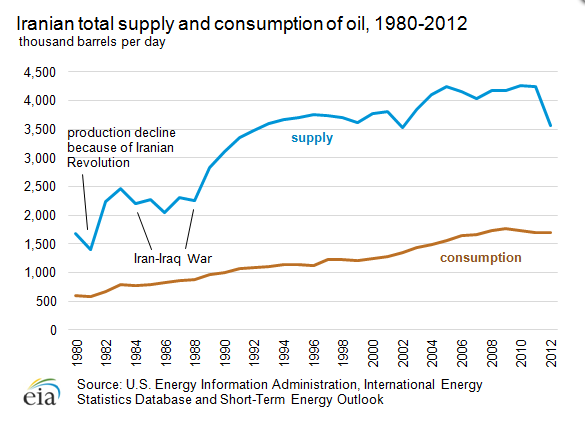 Iran is another country whose Oil Production is far below, about 1 bbl/d, its usual production level. This is caused by the embark imposed in 2011, which partially undermined Iran capability of exporting Crude Oil. Although the United States, United Kingdom, Germany, France, Russia, and China, coordinated by EU High Representative Catherine Ashton, and Iran arrived at technical understandings for the Joint Plan of Action in January, we do not believe that the sanctions will be removed in the short term. As far as demand is concerned, we see a downward trend coming from Europe, Japan and EMs. In fact EU and Japan, in which Environmentally Friendly sources of energy are growing in importance, have decreased their Oil consumption since the outbreak of the Financial Crisis in 2008. This slow but steady decline will continue to take place even if these Countries grow in 2014. Therefore, increase in Demand depends mainly on Emerging Markets, and especially on India and China. However, three factors will substantially decrease demand of oil. Firstly, the slowdown in both the Economies, especially in India, will directly reduce demand. Secondly, the recent Emerging Market Sell Off has and will have a negative impact on the belief of EM as endlessly growing. In the third place, growing concerns about health in big cities pushed Chinese Communist Party to start rethinking its Energetic Policy. WTI is a light sweet and theoretically superior quality of Oil, traded in the US and Canada. 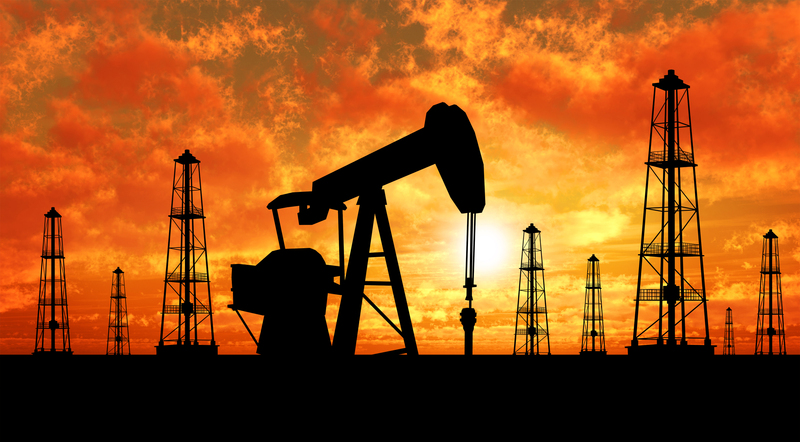 However, it is traded at variable discount from the Brent as in 1970 the US Federal Government imposed a strict legislation that substantially limits Crude Oil (CL) Exports. Even if refined products such as Heating Oil (HO) and RBOB can be exported, US refineries are designed to work with Oil of lower quality than WTI; this poses a ceiling on the ability of US to benefit of worldly demand, as not all the Oil extracted in excess can be refined in the US and then exported. Bilateral agreements allow US to export CL to Canada, but the whole country represents a tiny outflow of 0.1 bbl/d. WTI demand thus depends mainly on US Economy. Despite the Good Non-Farm Payroll we remain slightly bearish on US Economy, which in our opinion will not grow more than 2.5% y/y in 2014. Moreover, ecologic concerns, epitomized by Tesla Motors are being raised also in the US, and this will lower the impact of growth on demand. Supply is growing in both US and Canada, at an aggregate pace of about 1.7 bbl/d, driven by the exploitation of Shale Oil, whose extraction is profitable only above 100$ per barrel. However, due to sunk costs that Oil companies have already faced, the threshold level for a shrink in supply is below 100$ a barrel. Still, if WTI were remain considerably under 100$ per barrel for an extended period incentives to exploit new Shale Oil will disappear freezing supply. So, given these factors, how can we profit from future movements in Oil Prices? As Oil is a commodity, in order to bet on a fall in its price it is needed to short a future contract instead of the commodity itself. September’s futures seem slightly overpriced with respect to other maturities, as the seasonal November’s dip in price is already discounted. We believe that Brent price will fall thanks to the combined effect of increase in supply and decrease in the expectations about future growth in consumption. Our slightly bearish view about India and China growth, confirmed by last week data, strengthens the short position even further. The steep decline in WTI price, which followed the decision of the US Federal Government to release Oil from strategic reserves, gives us the possibility to properly hedge our position by buying a September Futures on WTI. We think that the market overreacted to this news, pushing the Brent-WTI spread well above its fundamentals. In fact, by taking a long-short position on WTI and Brent we are essentially betting on a reduction of the Brent-WTI spread. This portfolio hedges us against most of the Oil related shocks that might happen in the Oil Market, such as a Russian invasion in Crimea. Our target spread price, which should be seen as a stop gain, is about $5.00, unless the US Government starts considering removing the ban on WTI exports. We will do a follow up in May, updating our view on the Brent and WTI and on the Trade Idea.